On our last full day at Disney, we headed over to Epcot. Ethan fell asleep (of course) just as we entered the park so Cayne and I played around in Innoventions for a while during his nap. I made my own roller coaster and Cayne made his own video game. When Ethan woke up we rode Journey Into Imagination (he loved it) and let Ethan make his own figment before heading to Chefs de France for lunch. 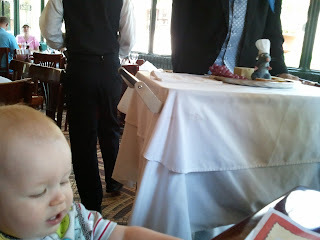 The french waiters coo-cooed over Ethan (and Ethan behaved very well) while we ate some delicious onion soup. Chef Remy from Ratatoiulle even stopped by to say "hello" to Ethan! 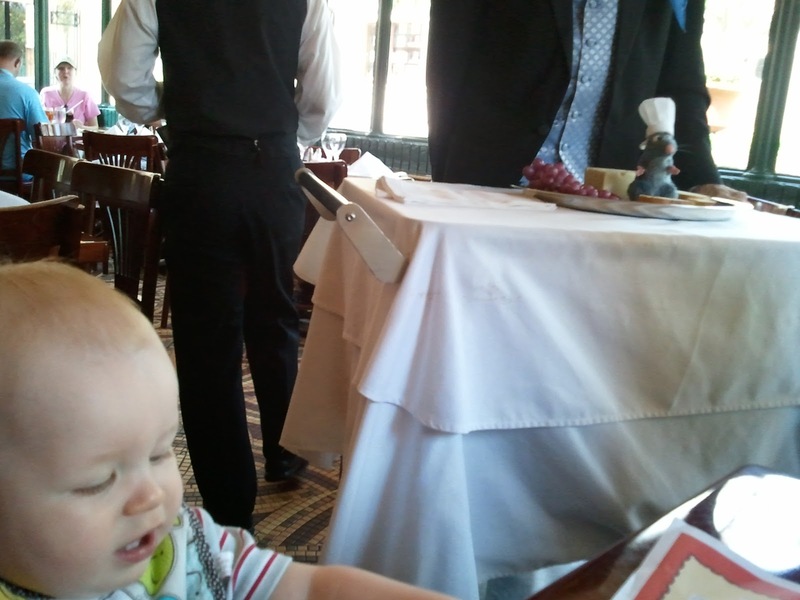 Ethan loved "Journey into Imagination with Figment"
Chef Remy wasn't as big of a hit as Donald, but he was still fun! After lunch, we walked around the World Showcase and rode Maelstrom at the Norway Pavillion before running into Donald on the way to Mexico. Ethan loved seeing his buddy Donald again and was even more excited to see Donald on the Gran Fiesta Tour (the boatride in the Mexico pavillion). Who do you see, Ethan?! Since we were right next to the test track after riding the Gran Fiesta Tour, we decided to ride test track again and visit the GM employee lounge with dad. In the lounge we had a great view of Epcot and a neat view of the inside of the ride too. Ethan was disappointed that he is still too short to ride but we told him he's halfway there! After a stop in the Baby Care Center and taking a while to wander around the World Showcase a little more, we gave Ethan to the grandparents to take to our new hotel for the evening, All-Star Sports, while Cayne and I had dinner in Morocco at Restaurant Marrakesh. It was a delicious dinner and afterwards we caught the bus for our new hotel. We had to wait a little bit for the bus, but it was shorter than any of our other bus waiting times and even though the bus was crowded, it wasn't any worse than the Beach Club buses were (hence, we were very impressed with the Value Resort transportation in comparison to Deluxe Resort transportation). When we got to the hotel, we still needed to check in. I waited in the short line for folks who had done their "online check-in" while Cayne went to bell services to pick up our suitcases that we had let Disney transfer for us. We were very pleasantly surprised to find that bell services had already put our suitcases in our room for us (awesome!) so we didn't have to carry them. Unfortunately, the crib I had requested in advance wasn't already in our room and it took about 45 minutes for them to bring it. We picked Ethan up from his grandparents' room and got him ready for bed and asleep in his crib once it finally arrived. The All-Star Sports room was nice. It was very small...not roomy but seemed pretty clean and in good condition. I wouldn't mind staying in one of the family suites at this resort (where you get 1 bedroom with a queen bed and a living room with a sleeper sofa), as long as I had my own car to get me to the parks and restaurants without needing to use the Disney buses. Our trip home was pretty uneventful. The Disney Magical Express was awesome again...we got to check our bags at the hotel and then didn't have to deal with them again until we got to Nashville. All in all, we had a very fun trip!